Well hi! It's been a while! I've been busy finishing up the first semester of my senior year (! ), battling a bout of the flu (including a first-time-ever visit to the emergency room. Way over-rated! ), and prepping for my senior collection before I graduate. I can't believe 2013 is over already, but believe me when I say I'm so ready to welcome 2014 with open arms. Let's hope for a better year for all! I haven't even gotten a chance to sit down and think about my resolutions, really. Have you? Does it involve stepping away from the internet? Stepping closer? Making more things with your hands or spending more time with your loved ones? I always go way overboard with my goals, so this year I really want to focus on a few and do them well. 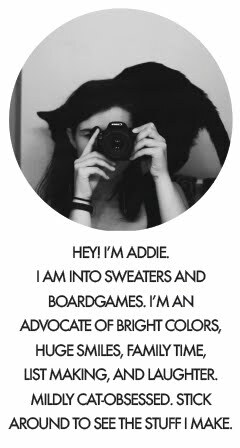 One thing that honestly had not occurred to me was putting more effort in here at the blog. When the lovely Carolynn from Kitty Adventures mentioned the January Blog Challenge I'd done a couple years ago to me, I couldn't stop thinking about it. It's been a long, long time since I've blogged regularly, and I like the idea of the challenge. But even better than that, I remember that when I did it last time, I made more effort to comment on other blogs, to reply to my comments, and regularly join in discussion. That alone is reason for me to try, as I'm woefully bad at these things normally! 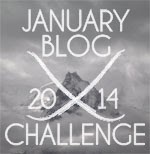 So here is my challenge: to blog five days a week, every week in January! Want to join me? Feel free to take the button above, and let me know if you're joining in so I can add you to the list on the Challenge Page! Have a Happy New Year, everyone! Happy New Year to you as well! I love hearing from people! Feel free to leave thoughts, questions, etc. Thanks, dolls! All Photos © Addie-Marie unless otherwise stated. . ||. Powered by Blogger.